I am very happy that You plan to come to Zagreb. I love Yoga from my childhood and someone like You who likes and lives Yoga so sinceraly I feel like my brother. I am sending You photo of one himalayan Yogi Tatvala Baba, on this photo he had about 150 years. I have been home for 2 days. Swimming in the ocean is great...but I also had a wonderful time in Europe. Did I tell you that I met Tat Wala Baba at his cave in Rishikesh in 1972? I asked him, as a big Yogi to a little Yogi, if he had any advice for me. He told me to get my belongings and come live in the cave beside his and practice Yoga. I was so happy! My visa was about to expire and I had a flight to the USA in 2 days. I asked him if I could leave and return. He said "yes". I returned to India as quickly as possible and went directly to Rishikesh to move in with Tal Wala Baba. When I arrived, I was told that he had been murdered a few months earlier. Each day at sunrise, he would go to the Ganges to bathe. He was found dead, shot in the back. The murderer was never caught, as far as I know. Even now, 32 years later, I am still greatly saddened by the memory. I wish you all the best. We will stay in touch. What a story... Can you post the picture of Yogi Tatvala Baba that Jadranko sent you? I'd love to see this great Yogi. I stayed in Rishikesh for a few more days and then went to South India and subsequently began learning the Ashtanga Yoga series in Mysore from K. Pattabhi Jois. 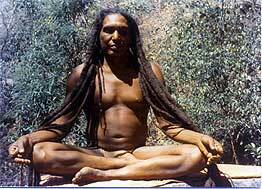 I became the 1st non-Indian to learn the entire Ashtanga system of asanas and pranayama from him and have practicing that system daily ever since. I just found this that I see is an old posting, and I thought I would add some thoughts anyway. The story I heard about Tat Wala Baba's shooting is that it was a confused follower who wanted to prove that Tat Wala Baba was immortal, and that Tat Wala Baba had expected it it in that he had been a soldier in WWI and had shot someone in the opposing force back then. Who knows? My favorite story about him, however, is one in which a visiting woman from England said something like, "Oh, Baba, you really must come visit England," to which he replied, "Madam, I AM England." A link to this has also been been added to the 'Articles' section of the ashtangayogi website.